Daily high temperatures increase by 12°F, from 37°F to 49°F, rarely falling below 27°F or exceeding 62°F. Daily low temperatures increase by 10°F, from 25°F to 34°F, rarely falling below 12°F or exceeding 43°F. For reference, on July 22, the hottest day of the year, temperatures in Petrozavodsk typically range from 55°F to 70°F, while on February 4, the coldest day of the year, they range from 9°F to 19°F. The figure below shows you a compact characterization of the hourly average temperatures for the quarter of the year centered on April. The horizontal axis is the day, the vertical axis is the hour of the day, and the color is the average temperature for that hour and day. Anchorage, Alaska, United States (3,939 miles away) and Rimouski, Canada (3,726 miles) are the far-away foreign places with temperatures most similar to Petrozavodsk (view comparison). The month of April in Petrozavodsk experiences rapidly decreasing cloud cover, with the percentage of time that the sky is overcast or mostly cloudy decreasing from 71% to 58%. The clearest day of the month is April 30, with clear, mostly clear, or partly cloudy conditions 42% of the time. For reference, on January 24, the cloudiest day of the year, the chance of overcast or mostly cloudy conditions is 82%, while on June 26, the clearest day of the year, the chance of clear, mostly clear, or partly cloudy skies is 53%. A wet day is one with at least 0.04 inches of liquid or liquid-equivalent precipitation. In Petrozavodsk, the chance of a wet day over the course of April is increasing, starting the month at 21% and ending it at 26%. For reference, the year's highest daily chance of a wet day is 38% on July 7, and its lowest chance is 15% on February 24. Over the course of April in Petrozavodsk, the chance of a day with only rain increases from 11% to 21%, the chance of a day with mixed snow and rain remains an essentially constant 4% throughout, and the chance of a day with only snow decreases from 6% to 2%. The average sliding 31-day rainfall during April in Petrozavodsk is increasing, starting the month at 0.6 inches, when it rarely exceeds 1.2 inches or falls below 0.1 inches, and ending the month at 1.5 inches, when it rarely exceeds 2.4 inches or falls below 0.6 inches. We report snowfall in liquid-equivalent terms. The actual depth of new snowfall is typically between 5 and 10 times the liquid-equivalent amount, assuming the ground is frozen. As with rainfall, we consider the liquid-equivalent snowfall accumulated over a sliding 31-day period centered around each day. The average sliding 31-day liquid-equivalent snowfall during April in Petrozavodsk is essentially constant, remaining about 0.3 inches throughout, and rarely exceeding 0.9 inches or falling below -0.0 inches. The average liquid-equivalent snowfall (solid line) accumulated over the course of a sliding 31-day period centered on the day in question, with 25th to 75th and 10th to 90th percentile bands. The thin dotted line is the corresponding average rainfall. Over the course of April in Petrozavodsk, the length of the day is very rapidly increasing. From the start to the end of the month, the length of the day increases by 2 hours, 50 minutes, implying an average daily increase of 5 minutes, 52 seconds, and weekly increase of 41 minutes, 3 seconds. The shortest day of the month is April 1, with 13 hours, 22 minutes of daylight and the longest day is April 30, with 16 hours, 12 minutes of daylight. The latest sunrise of the month in Petrozavodsk is 6:06 AM on April 1 and the earliest sunrise is 1 hour, 32 minutes earlier at 4:35 AM on April 30. The earliest sunset is 7:28 PM on April 1 and the latest sunset is 1 hour, 18 minutes later at 8:46 PM on April 30. Daylight saving time is not observed in Petrozavodsk during 2019. For reference, on June 21, the longest day of the year, the Sun rises at 2:54 AM and sets 19 hours, 39 minutes later, at 10:33 PM, while on December 22, the shortest day of the year, it rises at 10:03 AM and sets 5 hours, 14 minutes later, at 3:17 PM. The solar day over the course of April. From bottom to top, the black lines are the previous solar midnight, sunrise, solar noon, sunset, and the next solar midnight. The day, twilights (civil, nautical, and astronomical), and night are indicated by the color bands from yellow to gray. The chance that a given day will be muggy in Petrozavodsk is essentially constant during April, remaining around 0% throughout. For reference, on July 26, the muggiest day of the year, there are muggy conditions 3% of the time, while on January 1, the least muggy day of the year, there are muggy conditions 0% of the time. The average hourly wind speed in Petrozavodsk is essentially constant during April, remaining within 0.2 miles per hour of 7.3 miles per hour throughout. For reference, on April 5, the windiest day of the year, the daily average wind speed is 7.5 miles per hour, while on July 25, the calmest day of the year, the daily average wind speed is 5.9 miles per hour. The highest daily average wind speed during April is 7.5 miles per hour on April 5. The wind direction in Petrozavodsk during April is predominantly out of the south from April 1 to April 17 and the west from April 17 to April 30. The growing season in Petrozavodsk typically lasts for 4.6 months (141 days), from around May 15 to around October 3, rarely starting before April 27 or after June 2, and rarely ending before September 11 or after October 23. The month of April in Petrozavodsk is more likely than not fully outside of the growing season, with the chance that a given day is in the growing season increasing from 0% to 15% over the course of the month. The average accumulated growing degree days in Petrozavodsk are essentially constant during April, remaining within 7°F of 8°F throughout. The average growing degree days accumulated over the course of April, with 25th to 75th and 10th to 90th percentile bands. The average daily incident shortwave solar energy in Petrozavodsk is rapidly increasing during April, rising by 1.5 kWh, from 2.8 kWh to 4.3 kWh, over the course of the month. For the purposes of this report, the geographical coordinates of Petrozavodsk are 61.785 deg latitude, 34.347 deg longitude, and 269 ft elevation. 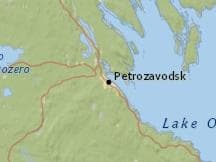 The topography within 2 miles of Petrozavodsk contains only modest variations in elevation, with a maximum elevation change of 367 feet and an average elevation above sea level of 259 feet. Within 10 miles contains only modest variations in elevation (784 feet). Within 50 miles contains significant variations in elevation (958 feet). The area within 2 miles of Petrozavodsk is covered by artificial surfaces (59%), water (26%), and trees (11%), within 10 miles by trees (64%) and water (30%), and within 50 miles by trees (64%) and water (34%). This report illustrates the typical weather in Petrozavodsk year round, based on a statistical analysis of historical hourly weather reports and model reconstructions from January 1, 1980 to December 31, 2016. There is only a single weather station, Petrozavodsk Airport, in our network suitable to be used as a proxy for the historical temperature and dew point records of Petrozavodsk. At a distance of 6 kilometers from Petrozavodsk, closer than our threshold of 150 kilometers, this station is deemed sufficiently nearby to be relied upon as our primary source for temperature and dew point records. The station records are corrected for the elevation difference between the station and Petrozavodsk according to the International Standard Atmosphere , and by the relative change present in the MERRA-2 satellite-era reanalysis between the two locations. Please note that the station records themselves may additionally have been back-filled using other nearby stations or the MERRA-2 reanalysis.